Piquant harmonies and idiosyncratic orchestration - a potent combination, equally powerfully in the execution. Panufnik has a feeling for dramaturgical effects, he loves large string parts, widely spreaded sound fields, heroic and hymnal elements. (...) Big praise for the Tampere Philharmonic from Finland. 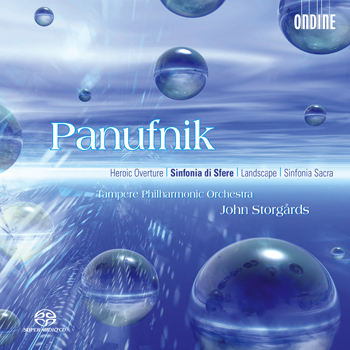 Under chief conductor John Storgårds it champions Panufnik's music with emphasis and virtuosity (...) but also with great subtlety and intimicy. John Storgårds spans the music's range from serenity to rhythmic incisiveness with a sure hand. Taken together the four pieces, in vivid performances under John Storgards, give a good sense of the power (...) of Panufnik's music. (...) a fascinating composer, able to combine the most ingenious schematism with biting and beguiling sonority. These four works give a good impression of his oeuvre. (...) The performances are fresh and vivid. Andrzej Panufnik, the most important Polish / British composer of the 20th century, was championed by conductors such as Stokowski, Solti and Ozawa. This recording features some of his major works on SACD for the first time. Panufnik studied composition in Warsaw and Vienna. During Nazi wartime occupation, he performed in piano duo with Witold Lutoslawski. All his early works were tragically lost in the 1944 Warsaw Uprising. He escaped from Poland in 1954, when the Communist imposition of Socialist Realism stifled creative freedom, and settled in England after which he 'ceased to exist' in his homeland. His third symphony, Sinfonia Sacra, won the Prince Pierre de Monaco prize in 1963 and became his most performed score. This CD also contains the first digital recording of the fifth symphony, Sinfonia di Sfere. The extensive booklet contains unpublished photographs from the personal collection of Panufnik's wife, Lady Camilla Jessel Panufnik.